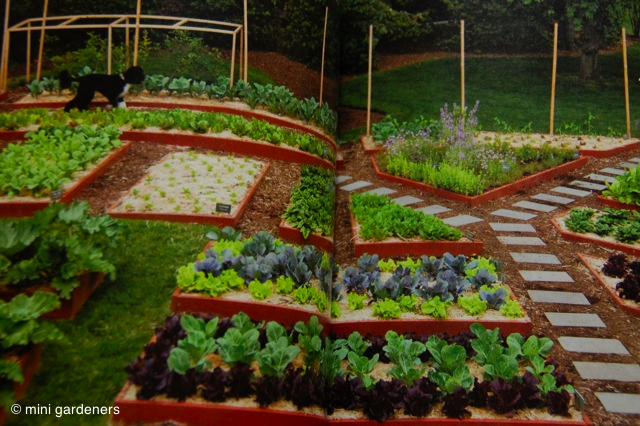 I confess to being intrigued every time the White House kitchen garden is mentioned in the press. I have sooooooo many questions. Is Michelle out there weeding every day? Is she an experienced gardener? How big is the garden? What do they grow? Do they ever have disasters? Do the girls and Barack pull the occasional weed? Luckily most of my questions have been answered in this book, published last year. 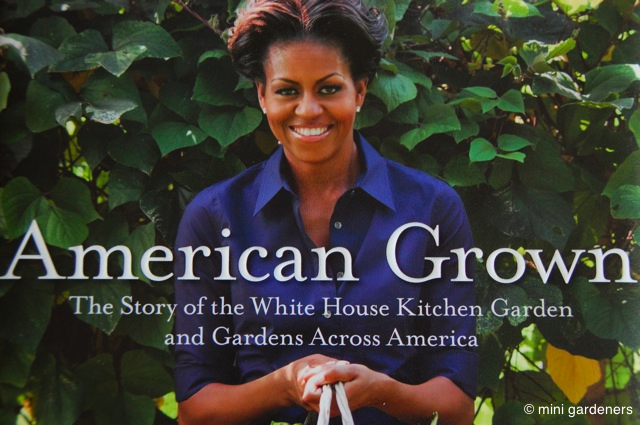 It’s a strange mix of the story of the development of the White House kitchen garden, Michelle Obama’s campaign for healthy eating and exercise to combat rising childhood obesity, profiles of community gardens across America and a few snippets about life in the Obama household. Oh and plenty of gorgeous, glossy photographs of the garden. So, is Michelle out there toiling in all weathers? Well the photo of her wearing white trousers in the garden was a bit of a giveaway. She was the catalyst for the garden but the day-to-day work is done by the National Park Service (who are responsible for all the White House grounds), helped by White House staff volunteers (apparently the volunteer rota is always full) and lots of lovely schoolchildren. What about the garden itself? When the kitchen garden was set up in 2009 they spent $200 on soil, seeds, seedlings and soil improvers, and made mounded beds cut out of the White House lawn. It now has 34 separate beds and covers 1,500 square feet so it’s not a token effort. They grow a huge range of vegetables, herbs and some soft fruit. I have serious sweet potato envy after seeing photographs of brick-sized sweet potatoes being harvested – my own attempts a couple of years ago produced what can only be described as sweet potato ‘fingers’. AND I’ve scoured all the photos with a magnifying glass but I haven’t seen a single weed. Any disasters or has it all been perfect? The mounded beds have since been converted into raised beds after heavy rain kept washing mulch and topsoil onto the paths. The blueberries keep getting munched by the birds, despite netting, and there has been limited success with pumpkins (aha, feeling slightly better about the sweet potatoes now). Rather mysteriously, the compost heap has a fan to speed up the process but there are no further details given. In spring and summer they mulch the beds with straw to cut down on weeding and to protect against heavy rains. They’re all hugely enthusiastic and it sounds like the sessions are extremely well-planned eg if they’re planting, the plants in pots are all laid out on the soil in their planting positions before the children arrive. The garden was a springboard for the First Lady’s Let’s Move! campaign and she says the aim of the garden was to start a conversation about the nation’s health. Any snippets about the Obamas? Well, they all sit down together for dinner at 6.30pm every night, apart from when Barack is travelling round the world. Conversation often turns to how their girls might deal with friendship issues at school – reassuring to know it’s the same the world over. Barack once returned home with a gift for her; a pair of gardening gloves (she was expecting a bouquet of flowers). They appear several times throughout the book and are the cleanest pair of gardening gloves I’ve ever seen. Inspired into action by anything in the book? Will I be mulching my vegetable beds with straw? Inviting schoolchildren round to help out? Setting up a community garden? Nope, nothing quite as worthy as that. Instead, inspired by Michelle’s immaculate outfits throughout the book, I’m resolving to look less like a tramp when I’m gardening. Categories: book reviews, grow your own | Permalink. Am sitting here, tramp like myself, with dirty knees on my jeans, shrivelly gardening hands (despite my filthy gloves). Thanks for the chuckle value of this post – brightened my evening! Yes I have the shrivelly gardening hands going on too. Is there a magic hand cream out there? Think I’m going to need it for my new less-like-a-tramp approach to gardening.